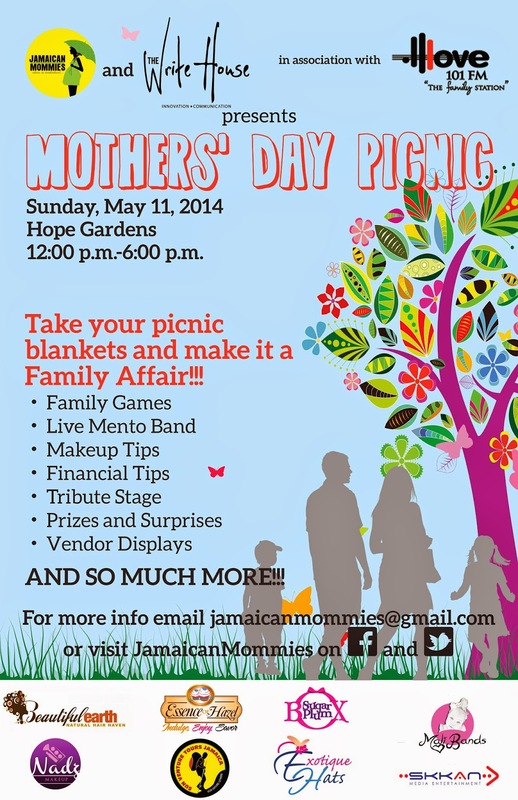 On Sunday May 11, 2014 the Hope Gardens Band Stand and lawns in Kingston, Jamaica will teem with life and excitement as Jamaican Mommies in association with the Write House and family station Love 101 stages the inaugural Jamaican Mommies Mothers’ Day Picnic. 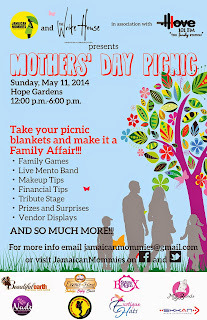 An initiative of the Jamaican Mommies blog, www.jamaicanmommies.com, the Jamaican Mommies Mothers’ Day picnic is free to members of the public and will showcase fun family activities while paying a special tribute to moms on Mothers’ Day. “We are therefore encouraging every member of the family to come on out and bring back the grand times of families having fun together” she continued. The Jamaican Mommies Picnic will delight with live music from an authentic Jamaican Mento Band, Makeup tips for moms, A Hat show, Family Games, Vendor displays, Prizes and Surprises among other exciting additions. The day will also feature a tribute stage where persons will get the chance to pay special tribute in songs, poem, dance etc to their moms for a chance to win one of the many fabulous prizes. Entire families are encouraged to come on out, take picnic blankets, food, umbrellas and be prepared to have a fabulous time. Sponsors for the event include: Sun Venture Tours, Skkan Media, Exotique Hats, Beautiful Earth Natural Hair Haven, Mali Bands, Essence of Hazel, Venposh Collections, All Okkassionz fashions and Sugar Plum box. Editor’s Note: We went back in our archives and realized we were trying to to pull together a picnic for quite a bit. It is always refreshing to see just how far we have come>> First our planning efforts and other links to our Picnic efforts from back in August 2009. Next Next post: What mothers will really love this Mothers’ Day: Smile Jamaica TV feature and more….